Are you planning a solo backpacking, trekking, camping or hiking expedition? Well, while your gear may comprise of a long wish list, the best single person tent to protect you from the harshness of the environment and weather will certainly come top on the list. You are lucky enough that there is an endless variety of one person tents available for you to choose from though this also comes with the headache of how to make the best pick. So, what factors should you consider when shopping for the best 1 person tent? Firstly, you are solo and you do not need something that will take you several minutes or hours to set up. Your tent should therefore be very easy to erect and take down. Secondly, do you need a big load to haul around even when camping in a car? I do not think so. Therefore, weight and overall portability must be important factors to consider. Just like with bigger tents, other factors would include peak height, choice of fabric and pole material, floor area among others. The bottom line is that as a solo hiker or camper, your backpacking should be light, fast and efficient. In order to make the process of shopping for your ideal travel shelter easier, we have come up with a list of the top rated single person tents that you can choose from. 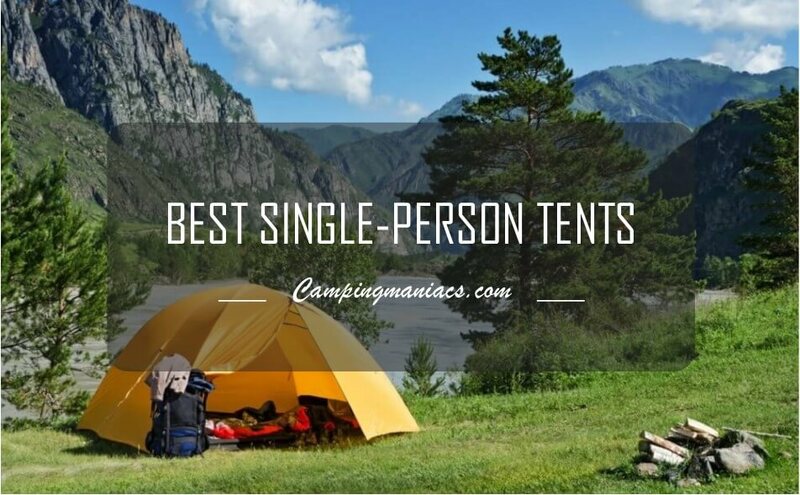 Which are the best single person tents of 2019? Let's take a dive into it and see which tent best suits your needs. The Winterial Single Person Tent is your perfect one person 3 season tent for hiking, camping and hunting. It has received positive reviews from users in various online platforms including Amazon. While our editors did admit that it also has its weaknesses, this bivy tent blends the most important features you would want in your solo summer hiking shelter in a way that is incomparable with its competitors. It is an ultra-lightweight tent that is easy to set up, sturdy, durable and fairly priced. As a bivy tent or rather low shelter tent, it is ideal for campers who will only need a tent to spend the night in and stay outdoors most of the time. This makes this tent a good choice for beginners, scouts and intermediate level backpackers. The Winterial Single Person Tent is an incredible gear for 3 seasons camping, hiking or hunting. Without the rain fly, the tent guarantees a great shelter during warm summer nights. On the inside, the non-freestanding tent features a mesh material that allows free airflow. In fact, you can easily gaze at the sky and stars as you enjoy your summer nights in the bivy tent. The ventilation is further aided by the mesh door that can easily be zippered in place. This, however, does not mean that the tent will not protect you from cold and rain as it comes with an all-round fly that is will protect you from cold and rainy wealthy. Finally, the tent fabric features fully taped and secure seams. As a non-freestanding one person tent, you are assured that the tent will not be carried away by wind, irrespective of how strong the winds are. The tent comes with three bundles of strong cords and 14 strong stakes that will not bend even when set on a very hard ground. Again, the weatherproof fabric features pre-sealed seams and a durable rain fly that will serve you reliably for years. Unlike most tent poles, the Winterial Single Person Tent aluminum poles will neither bend nor crack with frequent use. Has a vestibule where you can securely keep your camping gear. Low peak height hence most ideal for those who only need the tent for sleep. The Winterial Single Person Tent- Bivy Tent is undeniably your best solo camping, hunting or hiking tent. The 3 seasons tent guarantees comfort in warm summer weather with its mesh roof and a warm night on colder or rainy nights with its taped rain fly. This is more than a case of getting what you pay for. The tent is easy to set up, sturdy and durable. The only downside is its low roof that may not be so conducive for whole day and night shelter. One would ask why the Big Agnes - Copper Spur HV UL Tent is really popular among new and old users. Well, as one of the latest productions from the Copper Spur series of tents from the Big Agnes, it features commendable space to weight ratio, reliability and performance. In a flawless way, this tent strikes a great balance between space and comfort on one hand and lightweight on the other. Therefore, unlike most lightweight tents that compromise space and comfort, this lightweight tent is most suitable for fast solo hikers who value their comfort and space. Featuring steeper walls on the inner sides of the tent, the Big Agnes - Copper Spur HV UL Tent boasts of a bigger volume giving users more space and comfort. The tent has a total weight of 2 lbs. 8 oz. and a floor space of 20 square feet providing a remarkable weight to space ratio. It is illogical to talk about the performance of a tent without mentioning anything on the materials and workmanship. The double, high quality ultralight ripstop nylon fabric and the 2-tone mesh are great in keeping you dry during cold weather and ensuring enough ventilation during warm and dry nights. Consisting of just a single feather light pole and an ultralight fabric, this tent is one of the easiest to set up hence ideal for fast mono hiking or camping. The unzipped single door is easy and fast to stow. The single pole is designed in such a way that a hook and loop tabs automatically connect to a single vent fly ensuring sufficient pitch and additional stability. These hooks and loops, together with the tensioners and guy lines on the fly make setting up this tent incredibly easy. A vestibule and pockets provide massive storage space keeping your tent more organized. Has a fly that is helpful when there is rain or in very cold weather. Has a footprint that is sold separately. As a 3 season tent, it may not be great for winter hiking. 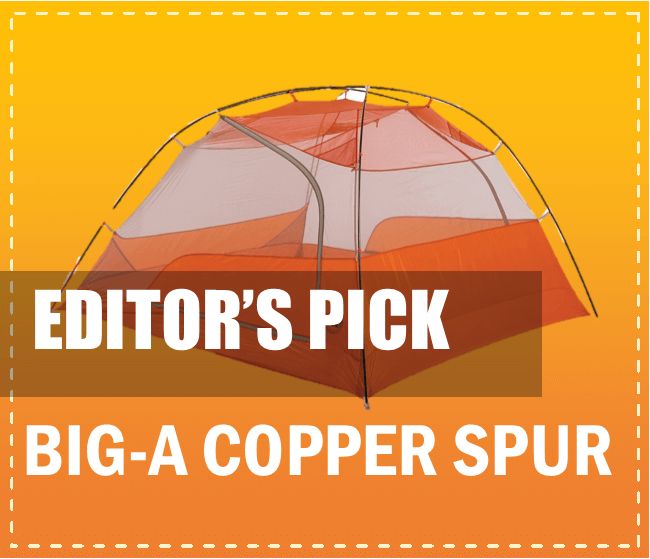 The Big Agnes Copper Spur HV UL 1 Tent is your ultimate backpacking buddy. It is popular among most users due to its versatility and reliability which are both aided by the tent's massive storage space, ease of set up, portability, spacious floor area as well as the fabric's durability and stable poles. While a few people think that the footprint should be included in the purchase price, most users think that the price is worth what you receive hence a good investment. The Eureka Midori Solo - 1 Person Tent is your typical one person tent that maximizes livability by giving you adequate space, ventilation and adaptability courtesy of the V3 Enhanced System. While this is a 3 season tent and will certainly be great for all kinds of conditions due to its weatherproof fabric, the tent will give you much more than just shelter if you happen to use it for summer camping, kayaking, hunting or hiking! Ideally, this is one of the tents that is designed for both newbies and routine scouts. Not so many tents are as adaptable as the Eureka Midori Solo - 1 Person Tent. The reason why our editors rated this solo person tent the best tent for summer is its all mesh walls that will give you top notch ventilation and a comfortable sleep during warm or hot summer nights. But again, not all your backpacking will be planned during summer and even if so, then weather can at times be quite unpredictable. This is the reason why the tent comes with a factory-taped full coverage polyester rain fly to protect you from cold or rainy weather. Moreover, the single spacious door is hooded. Isn't this adaptable? While freestanding tents may not be so good in areas with strong winds, they are fast and convenient for fast hikers. They do not take long to assemble and can conveniently be moved to more even grounds after assembly. Moreover, freestanding tents will easily be assembled even on harder grounds where poles of non-freestanding tents may not get in. Packed Weight: 3 lbs 10 oz. Weatherproof and ideal for a wide range of weather conditions. Has a vestibule and storage pockets for your hiking gear. The poles may start wearing off from the tips after years of continuous use. Needs a lot of stakes to secure. Vestibule door opens opposite the tent door hence making entering difficult without crawling to the ground. The freestanding Eureka Midori Solo Backcountry Tent may not be a dream tent for professional scouts or campers but is a sure camping gear for novice to intermediate backpackers. At an affordable price, this premium tent goes farther than just providing you with basic shelter out there. It is easy to set up, reliable, highly adaptable and a offers an amazing view of the clear summer sky and constellations and asterisms of stars. Despite the few concerns about its poles, this is a tent you would be glad to have if you value a good night sleep, comfort and star viewing! One person camping tents are no longer a reserve of those high in the economic ladder, thanks to the ALPS Mountaineering Lynx 1-Person Tent. You no longer have to shelve your backpacking trips simply because you cannot afford a good solo person tent. At a very affordable price, ALPS Mountaineering gives you a tent that is compare competitively with rivals that cost much higher. The freestanding tent offers enough space, absolute protection and good ventilation for solo hikers. In essence, this is an ideal tent for anyone working on fixed budget but still wants to get the best out of short backpacking expeditions. Without cutting down on most of the vital features, one of the major selling points of the ALPS Mountaineering Lynx 1-Person Tent is its price! Costing way less than $100, the double pole tent is made from a weatherproof fabric that will protect you from the harshness of the environment. The mesh fabric on the top, aided by the large D-shaped door and the small side windows essentially provide the needed ventilation as you take your deserved rest. In fact, the door can securely be clipped on the left side of the tent to provide a good view of the exterior environment when you sit in your tent. Save for the lack of a footprint, this is a complete tent with all-round features. It is made from strong and sturdy aluminum poles and a weatherproof polyester fabric to last long. It also comes with 10 aluminum pegs, a rain fly and extra fabric swatches to conveniently patch the tent when there is need. Well, these accessories look so many and disjointed but you do not need to worry as the entire assemblage comes will a carry bag with handles and straps for portability. Has a spacious vestibule for storing additional hiking gear. A freestanding tent that is easy to set up. Comes with a carry bag for easy portability. Does not come with a footprint but this can be purchased separately. Slightly heavier than most one person camping tents. The ALPS Mountaineering Lynx 1-Person Tent may not be your dream tent since it is not as lightweight as you would want for a one person camping tent but it is highly affordable and great for car or motorbike hunting, camping or hiking. It comes with high quality zippers on the vestibule and the door to extend your tent's lifespan. We have a very positive feeling about this tent and will confidently recommend it to anyone on a fixed budget. TETON Sports is a big brand in the outdoor gear industry, and they have continued to build their brand with the exemplary TETON Sports Mountain Ultra 1 Person Tent. This tent has been in the market for years and has consistently remained one of the best in the long list of one person tents. What makes this tent stand out? Well, there are so many obvious reasons like ease of set up, durability, choice of materials and versatility. However, the two non-obvious reasons we chose to look at are the fact that it comes with everything you need in a tent and secondly, it is simple but flawless design. Nothing is as irritating as ordering different tent accessories after choosing your ideal tent. Well, you will not experience this with the TETON Sports Mountain Ultra 1 Person Tent as it includes everything that you would want to use in the wilderness in the same order. In one package and at an affordable cost, you get the tent, the rain fly, stakes, footprint, poles, cords and everything else you will need during the assembly and use of this impressive tent. Isn't this an amazing deal? The tent features a single aluminum pole that helps in fast set up and breaking down. The pole supports an inner mesh tent that effectively ventilates the tent and aids condensation when used without the polyester rain fly during warmer nights. In order to ensure that the tent lasts longer than your ordinary backpacking tent, the mesh fabric have reinforced seams and reliable anchor points. Finally, the 150D Oxford canvas that makes up the extra high bathtub like floor is all you need from uncomfortable grounds. Heavier than some of its competitors. Has a somehow larger packing size. The tent is fairly heavier than its competitors and as a matter of fact, TETON Sports Mountain Ultra 1 Person Tent is not a tent you would go for if weight is your only consideration. But since weight is never the only factor to look for in a one person tent, this tent is still a great choice for solo campers as it comes with a wide range of merits. It is easy to use, comfortable and reliable and features a great design hence ideal for backpackers on short grips or those using cars or automobiles. It is impossible to discuss any category of outdoor gear without mentioning at least a single model from Big Agnes Company. They are a credible manufacturer of camping gear and they prove that with the improved award winning design of the Big Agnes Fly Creek HV UL 1 Tent! Without unnecessary weight, you have a high quality backpacking tent that is reliably suitable for all kinds of weather conditions. The tent is not just about the name but also about the increased volume for your comfort, enough storage area for your camping gear and a weatherproof material to protect you from all kinds of weather. At just 2 lbs. and 1 oz. when packed, this is one of the most ultralight tents you have at your disposal. The tent is incredibly light and ideal for fast solo campers who want to have it light as they adventure in the wild. However, lightweight does not necessarily a mean small volume as manifested by the Big Agnes Fly Creek HV UL 1 Tent. The design features steep walls and a SF hub pole system allowing increased interior space without adding any weight. This creates a usable floor area of 20 square feet, which is sufficient for single person use. There is no economic sense in investing in a tent that you will only use for a single season. Even is you are typically a summer hiker or camper, purchasing a tent that goes beyond summer hiking is a plus as over time, certain items may come up unexpectedly or change. The Big Agnes Fly Creek HV UL 1 Tent cushions you from the unknown by the use of materials suitable for a wide range of weather conditions. The freestanding tent has a dry entry vestibule that keeps off snow and rain when you move out. Again, both the floor and the fly have a polyurethane coating and taped seams that are weatherproof. 2 media pockets, interior mesh pockets and a vestibule to keep your gear in place. The freestanding The Big Agnes Fly Creek HV UL 1 Tent is a product fast hikers who would not be happy with an extra ounce of weight in their gear will be proud to own. A bigger advantage is the fact that despite its lightweight design, you have sufficient space for storage and comfortable sleep. While it may not be very conducive for use in areas with very strong winds, this is a solo person tent worth investing in. The Big Agnes never disappoints its customers by going beyond the ordinary, and in the Big Agnes Rattlesnake SL1 mtnGLO Tent, they have given backpackers the luxury of lighting up their camps. This tent is illuminated with the patented mtnGLO Tent Light Technology which guarantees users sufficient light with just a single click of a button. Apart from the LED lighting, this tent is durable, easy to set up, super lightweight and weatherproof. It is therefore suitable for seasoned backpackers and scouts but newbies will also find it out of the ordinary. The super light Big Agnes Rattlesnake SL1 mtnGLO Tent is a solo person, 3-season tent that features a patented mtnGLO LED lighting system that ensures that your back country trip stays bright throughout. It features LED lights which are flawlessly integrated into the body of the tent and a switch to enable on and off operation. The system uses 3 AAA batteries and guarantee at least 90 hours of hand free bright lighting to help you sort out your camping gear. This single door, one person tent is one of the most spacious tents with an interior sleeping area of 23 square feet for comfortable sleep and rest. However, it is not all about your sleep and comfort but also the convenience and safety of you camping gear as well as your entertainment. It has a one 9 square feet vestibule that will provide enough storage for your camping gear, two media pockets to conveniently route earphones from phones or other devices and 3 mesh pockets where you can keep all the small backpacking stuff off the ground and organized. Can you ask for more? AAA batteries are bought separately. Not the most lightweight one person tent. The Big Agnes Rattlesnake SL1 mtnGLO Tent is a one person 3 season tent that is popular among back country backpackers. It conveniently provides you with a spacious sleeping area, enough storage space for your camping gear and a sturdy shelter that you will enjoy using for years. Moreover, the tent features the patented mtnGLO Led Lighting System that comes in handy when you set base in the dark and you need to organize your backpacking gear or prepare a meal. The Hewolf Outdoor 1 man Tent for trekking/riding/hiking/camping, waterproof tent is all you need for whole year camping even in very snowy environments. Whether you have a solo camping experience or not, there are not so many tents that will put you into the limelight like the Hewolf product will. The two door one person tent is easy to use, adaptable, durable and highly versatile. However, being slightly heavy, this tent is suitable for those using automobiles. Most of the tents available in the market and those reviewed here are 3 person tents. The Hewolf Outdoor 1 man Tent for trekking/riding/hiking/camping, waterproof stands out as a suitable tent for 4 seasons hence ideal for campers all year round. To start with, the tent features two doors for easy entry and exit. Secondly, it features a double layer of fabric that you can conveniently use independently. That is to say that you can use the inner tent or the outer tent separately or together. This tent also features a pair of mesh windows and half mesh walls for ventilation. Well, the real deal about this tent is the tent material. The lower part is made from 210D Oxford cloth with high density PU coating while the outer section is made from high quality anti tear polyester with waterproof coating. The Hewolf Outdoor 1 man Tent for trekking/riding/hiking/camping, waterproof tent is the most versatile tent you can come across. It is easy to set up and ideal for hiking, biking, camping, trekking, fishing, kayaking and riding among other outdoor activities. This is also due to the fact that it is a 4 season’s tent, its durability and adaptability. Open both doors for extra ventilation and a good view of the exterior environment during warm weather. On the other hand, close them to keep yourself warm when camping in alpine conditions. Again, this tent comes with a carry bag to help you move around with it conveniently. Weatherproof and ideal for 4 seasons. Comes with a carry bag for easy transportation. Two doors for easy entry and exit. Slightly heavier than most tents hence most ideal for hikers with automobiles. The design does not look incredibly trendy and should be improved. Apart from the weight and design, Hewolf Outdoor 1 man waterproof tent is your ideal tent for all seasons. It is well ventilated and weatherproof which means that it will provide comfort in warm summer nights and the deserved warmth in the snowiest conditions respectively. If you are an all year hiker then this fairly priced tent is all you need for the unpredictable weather conditions you are bound to brave. Sierra Designs has nailed it again with their non-freestanding Sierra Designs Flashlight 1 Tent. It is an extremely livable and comfortable single person tent ideal for both backpacking and camping. The tent is really easy to pitch and features an amazing blend of single wall and double wall designs essentially preventing the inner wall of getting soaked during heavy downpour. The tent is an improved design from the previous tents and provides amazing airflow and an ability to block cold winds. Really convenient, isn't it? The Sierra Designs Flashlight 1 Tent is an ideal tent for adventurers who value simplicity without compromising their comfort. It features a hybrid single and double wall design which effectively reduces weight and necessitates dry and easy set up. You can further reduce the weight of your package by pitching the tent on a pair of trekking poles instead of using the main tent poles. You therefore can use the trekking poles during the day for hiking and at night as your shelter. However, even if you choose to pitch the tent on trekking poles, you still need to carry the small poles that secure the end of the rain fly. Another important feature of the Sierra Designs Flashlight 1 Tent is its large hooded door. The door has an 8-inch overhang awning that guarantees dry entry and exit. The overhang awning also provides a good shade from the sun and also protects you from the rain as you can just leave the door open when it is raining. Irrespective of the time of the day and weather condition, the large door provides an airy feel. Slightly heavier than most camping tents. The instruction manual is not very clear. The non-freestanding 1 person 3 seasons tent is an incredible choice for people who want to have it simple. While it is usually branded a starter camp, this camp can also be used by scouts and those who have been on the trail for years or even decades. At an affordable price, the Sierra Designs Flashlight 1 Tent guarantees sufficient airflow, comfort, weatherproof ability and more importantly, it is easy to pitch. When it comes to camping tents, space and comfort goes hand in hand. The Archer Outdoor Gear 1 Man Camping & backpacking tent is the most spacious one person tent and still boasts of a sleek design. This compact backpacking and camping tent is spacious, easy to pitch and provides unrivalled privacy. The tent costs much less than $100 and is the kind of tent all our editors agreed that is ideal for just everyone out there. Most camping tents either have enough interior length and a very narrow width or a shorter length and a wide width. Well, this cannot be said of the Archer Outdoor Gear 1 Man Camping & backpacking tent. At 210cm by 100cm by 110cm, this is arguably the largest and most proportional solo person tent you can come across. In essence, a bigger sleeping space means more comfort and a bigger space to store your backpacking gear. It is a tent for any big person out there as it provides a reasonable length and width for everyone. The Archer Outdoor Gear 1 Man Camping & Backpacking Tent is not a tent that you will use a couple of times and dispose. The manufacturers ensure a great choice of materials as well as great workmanship. The outer shell is basically made from durable 190T polyester while the bottom is made of a double layer of waterproof ripstop nylon. The Archer Outdoor Gear 1 Man Camping & Backpacking tent is our last in the review of the best one person tents. It makes it to the list because of its lightweight and spacious features. Without spending a fortune you get enough space, unrivalled privacy and a tent you will find easy to carry and set up anywhere.